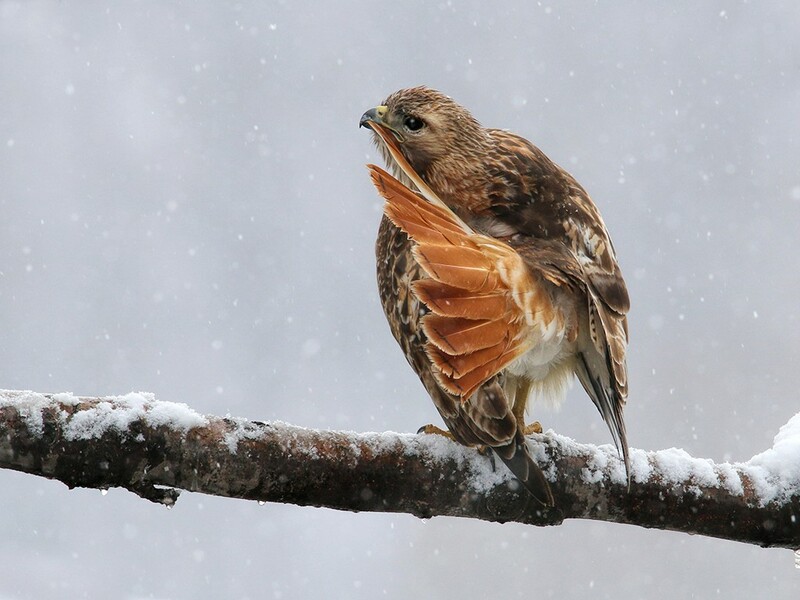 Red-tailed Hawk by Peter Ferguson, first-place winner in the Overall category of the 2015 GBBC Photo Contest. And now, one of the most anticipated moments of the Great Backyard Bird Count–revealing the photo contest winners from the last count! Peter Ferguson of Ontario wowed the judges with his beautiful photo of a Red-tailed Hawk preening amid gently falling snow. Peter received the Elite Classic Sunflower/Mixed Seed Feeder from Droll Yankees for his win. Other category winners received items donated by Wild Birds Unlimited. The photo above doesn’t really do justice the beautiful details, so be sure to visit the GBBC Photo Contest winners web page to see a larger version and find out the top five winners and honorable mentions in all six contest categories. Congratulations to all our winners! Photo by Nick Saunders, Saskatchewan. 2012 GBBC. And who might this jaunty little fellow be? 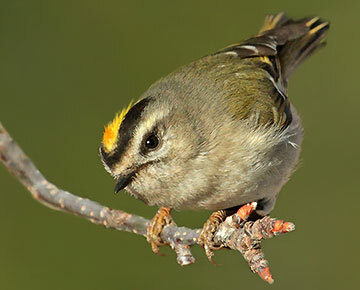 Despite its size–only about 4 inches long–this hardy little bird can survive temperatures down to 40 degrees below zero! During the winter it ranges over much of North America but it’s not easy to find because this species prefers to hang out at the tops of trees. 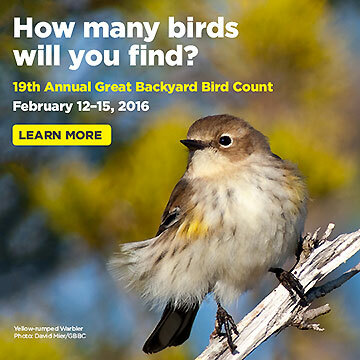 But it is a bird you might see during the Great Backyard Bird Count. Get the answer. Every participant in the GBBC is an “ambassador” for the count and a vital force in keeping the event growing and gathering data about birds all over the world. With that in mind, this year’s selection of e-cards is ready to go! Choose from among half-a-dozen designs to send to family and friends to remind them about the count and get them to participate. Cards are available in English, French, andSpanish. Doing the GBBC in New Mexico. Photo by Stacey Swinehart, 2015 GBBC. We’re offering a free live webinar to help teachers, homeschoolers, informal educators, nature centers, and others teach science using the GBBC. 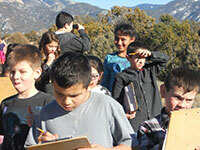 You’ll learn about citizen science and how to participate in the count. 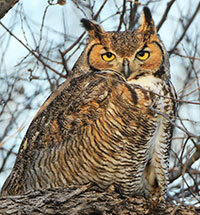 Great Horned Owl by Troy Calverley, Texas, 2015 GBBC. While you might spot a sleepy owl during the day, you’re more likely to hear one–especially if you’re birding at night. Owls make many more sounds than you might realize. Learn the sounds of five common North American owls species to better your chances of checking off one or more of these charismatic raptors for your GBBC tally! Is your nest box ready for winter? With a few adjustments, you can convert it into a cozy winter roost box. Photo by Tammie Sanders. 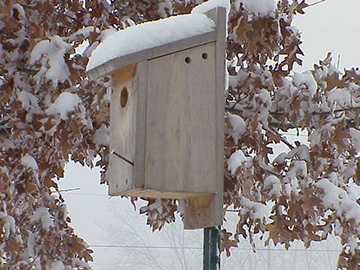 Birds who live in areas where winter brings cold, harsh weather may use roost boxes as a place to huddle together for warmth and protection–especially birds that nest in cavities. With some winter-proofing, nest boxes can also become winter shelters. Read more.